(NASHVILLE, TENN.) January 28, 2010 – Yesterday at Belmont University’s Ocean Way Studios, multi-platinum, GRAMMY and Dove Award winning artist, Michael W. Smith gathered a who’s-who list from the music community to record “Come Together Now.” The song, penned by Smith, David Mullen and Cindy Morgan – and produced by Bryan Lenox – was written to remind people of the need to help those in Haiti. In addition to lending their voices in song, several artists also recorded PSA’s for The American Red Cross and Samaritan’s Purse for use in upcoming months. 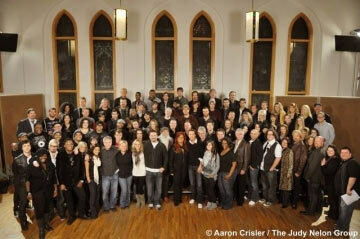 The song will be made available for sale soon, with all proceeds going to benefit relief efforts to Haiti. More details on the song’s release date are forthcoming. Throughout his 27-year career as a recording artist, Michael W. Smith has amassed an impressive catalog of achievements. His 21 albums have garnered multiple honors including an American Music Award, three GRAMMY ® Awards (from 13 nominations), 44 GMA Dove Awards and 33 No. 1 radio hits. In addition, he holds 16 Gold and five platinum albums for career sales approaching 15 million. Smith, who was inducted into the Gospel Music Hall of Fame in 2009, has scored several film projects, written 11 books and has been featured by media outlets including, NBC’s Today Show, Good Morning America, NBC Nightly News, Larry King Live, FOX and Friends, Hannity and Colmes, USA Today, NY Times, The Washington Post, LA Times, Newsweek, has been named one of People Magazine's “Most Beautiful People” and has presented multiple times on the GRAMMY Awards show. His tours consistently rank among the best attended in the country, and he has performed to capacity crowds throughout the world.